Chris Eatough, a former professional biker and the director of BikeArlington, envisions an Arlington County where there are more bikes than cars. In order to get there, says Eatough, the county needs to create a connected network of protected bike lanes. Eatough has spent the last five years helping to guide the county’s transformation into a great place to get around by bike. 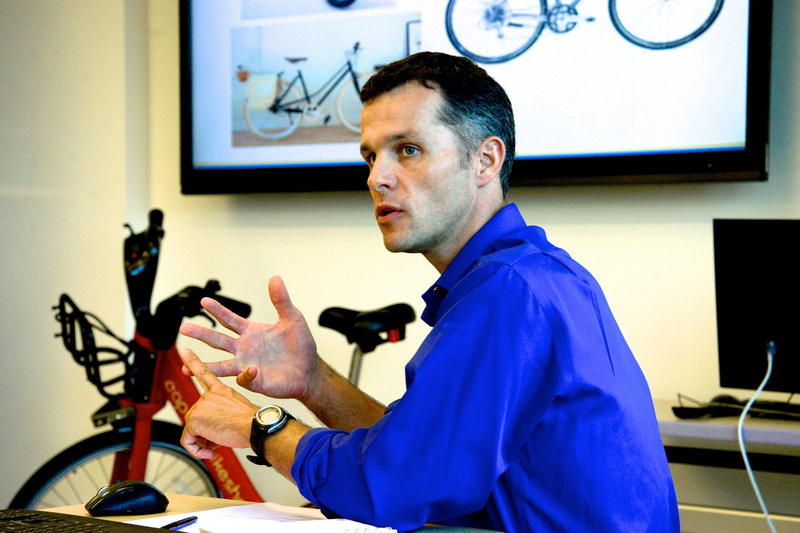 He spoke about the state of the county’s bike programs at Mobility Lab’s Lunch at the Lab this week. Protected bike lanes, also referred to as cycle tracks, are “like sidewalks for bikes,” according to People for Bikes. These bike lanes are often painted green and are segregated from automobile traffic by planters, pylons, curbs, parked cars, and, in the case of San Francisco, cactuses. While protected bike lanes have doubled in number nationwide since 2011, Arlington only recently opened its first protected bike lane this week in the Pentagon City neighborhood. These lanes are integral to getting more people to choose bike instead of other modes. A Portland Office of Transportation study shows that 60 percent of potential cyclists are interested in bicycling but concerned over issues such as safety. A big way to address the concerns of this “interested but concerned” population cohort is by creating segregated lanes for bicyclists. The benefits these lanes provide are tangible, and not just relegated to bicyclists. 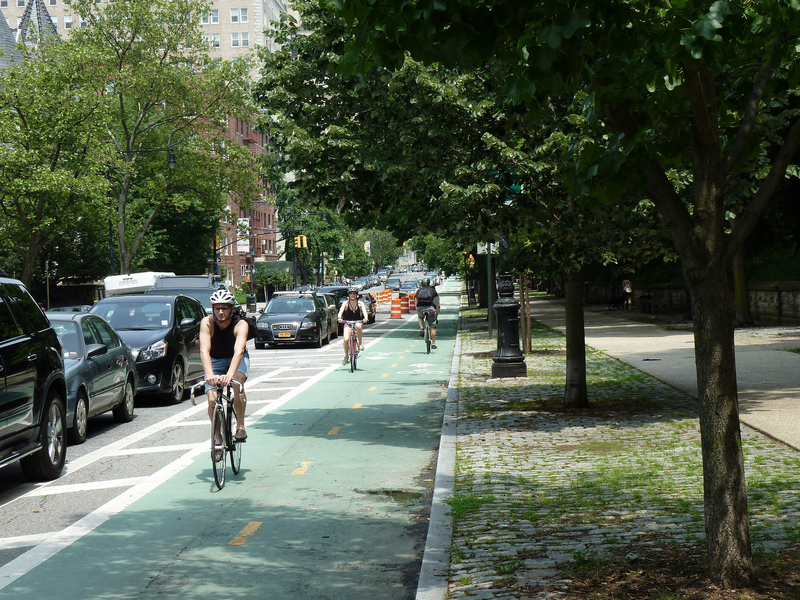 A study in New York showed that protected bike lanes decreased injuries to all street users by 56 percent. A Portland study showed that 96 percent of people feel safer on a street with a protected bike lane. Protected bike lanes, as part of a complete-streets policy, are effective placemaking tools as well. These lanes can transform a street or neighborhood into a destination rather than just a place to travel through. In Washington D.C., for instance, 83 percent of residents in the vicinity of the 15th Street NW protected green bike lane consider it a valuable neighborhood asset. BikeArlington, a program of Arlington County Commuter Services, is engaged in encouraging more people to bike more often. Eatough’s last day as BikeArlington director is August 28. He is leaving to become Howard County, Maryland’s first-ever bike and pedestrian coordinator. Splash photo by Nick Falbo on Flickr. Story photo by Dani Simons on Flickr. Chris Eatough photo by M.V. Jantzen on Flickr. Are Suburbs The Secret to Walkability in D.C.? Are Streets, Like Fences, A Relic of Another Era?